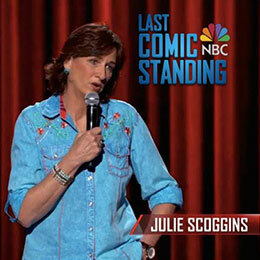 A former trucker, pooper scooper, & charm school graduate from Charlotte, North Carolina, Julie has been touring as a full time standup comedian for over 15 years. On the road approximately 36 weeks a year with one week a month set aside for “marriage preservation”. 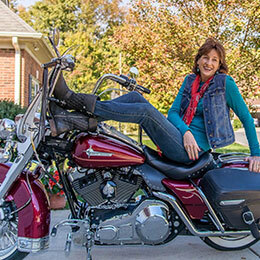 She loves riding her motorcycle to gigs & you’ll frequently see her 2004 Harley Road King parked outside the club, theater, radio, or TV station. Julie’s regularly heard on XM/Sirius Blue Collar Radio, as well as many syndicated stations including the John Boy & Billy Show, and the Bob & Sheri Show, (Charlotte, NC), & the Bob & Tom Show (Indianapolis, IN). 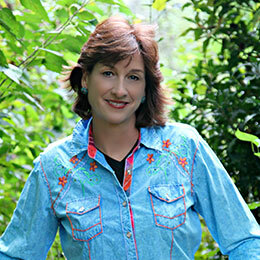 A Southern girl with universal appeal, Julie’s shows sell out from Florida to Oregon. Folks actually WANT to sit in the front row & have been known to return a second night, just so they can bring friends that haven’t yet seen her. “Phyllis Diller started comedy at 37 years old & so did I. She went on to have a fabulous career that lasted over 40 years. I hope to be just as fortunate. It’s so awesome to be doing exactly what I feel like I’m meant to do!”.